Yes, that is cake. Obviously not the head, chest or arms, but there is cake in there. Follow the link to its Cake Wrecks home and you can even see a woman cut into it! Perhaps I will commission an enormous cake in my image, thereby doubling the amount of me at my wedding! 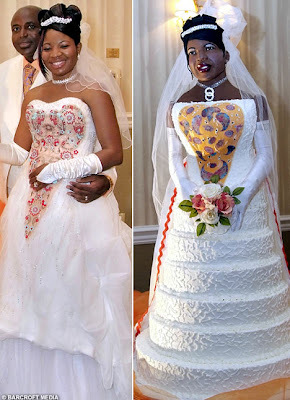 Chidi Ogbuta of Texas nationality actually commissioned a Chidi-replica in cake and fondant for her big day; the self-absorption is really helped by that ungodly dress! More horrifying cakes to come this week!